6 Piece Set: Home Basics Bamboo Kitchen Tools with Colored Handles Just $9.99 Down From $29.99! Ships FREE! 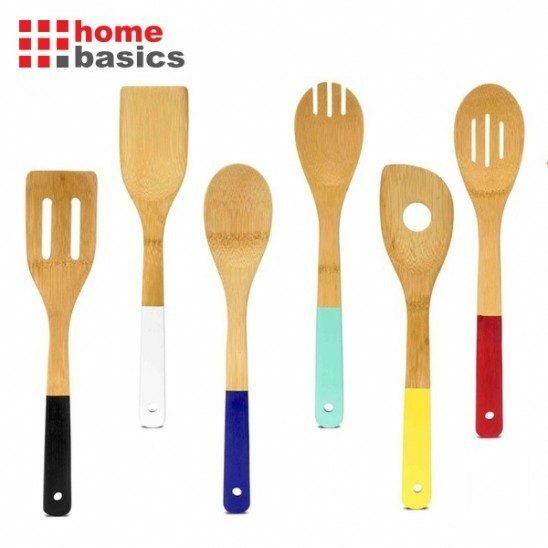 You are here: Home / Great Deals / 6 Piece Set: Home Basics Bamboo Kitchen Tools with Colored Handles Just $9.99 Down From $29.99! Ships FREE! GearXS has this 6 Piece Set: Home Basics Bamboo Kitchen Tools with Colored Handles on sale for $9.99 (Reg. $29.99) + FREE shipping! The perfect addition to any kitchen, this 6 piece set of kitchen tools are constructed using durable bamboo material. Products made of bamboo are denser than oak or maple, and are also great for the environment due to its fast-growing nature. Each tool is untreated, so they are completely safe to touch your food, even under high temperatures. The handle of each tool is color coded with bright colors for easy identification in drawers.